With plenty of room for friends and family to gather around, the Rectangular Dining Table gives you an outdoor dining room in your own back yard. The table seats up to six people making it the perfect spot for a dinner party. 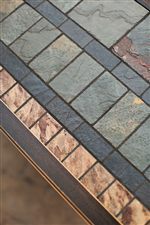 The table's stunning slate top brings a variety of colors and texture making it really stand out. The aluminum frame is finished with a dark, rich bronze finish complementing the green slate top. The Greenbrier Rectangular Dining Table w/ Green Slate by Agio at Westrich Furniture & Appliances in the Delphos, Lima, Van Wert, Ottawa, and Celina area. Product availability may vary. Contact us for the most current availability on this product. Maintenance Clean your frames regularly using mild soap and clean, warm water. Do not use abrasive materials or cleansers. Maintain your frames by covering with commercially available furniture covers or storing out of the elements when not in use. Always clean and dry thoroughly before storing. Get outdoors with the stunning and sophisticated Greenbrier Outdoor Collection. Invite friends and family over to enjoy your outdoor space with a lot of seating options providing style and comfort. The aluminum frame throughout the collection has a dark, rich bronze finish and is meant to withstand the outdoor elements. The use of slate brings out a variety of color and texture to each piece truly creating a statement that everyone will be talking about. The Greenbrier collection is a great option if you are looking for Transitional Outdoor Furniture in the Delphos, Lima, Van Wert, Ottawa, and Celina area. Browse other items in the Greenbrier collection from Westrich Furniture & Appliances in the Delphos, Lima, Van Wert, Ottawa, and Celina area.